Pyronix is set to showcase its latest perimeter protection and video solutions at the Security TWENTY 19 Glasgow Conference and Exhibition, on Tuesday 30th April. Pyronix Account Manager for Scotland, Bryan Evans, and UK Sales Director, Guy Dodd, will be on hand at the Hilton Hotel (William Street), Glasgow, to discuss the latest perimeter protection offerings and highlight the new features of the ProControl+ app. “We’re excited to meet our customers to discuss our perimeter protection solutions and demonstrate how the new features of the updated ProControl+ app can provide added value to a security system,” Bryan said. Detecting an intruder before they are able to gain access to a property is one of the most effective ways to prevent any further disturbance. Pyronix perimeter protection offers a wide range of capabilities for both inside and outside a property, including outdoor detectors, magnetic contacts, shock sensors, cameras and the ProControl+ app. 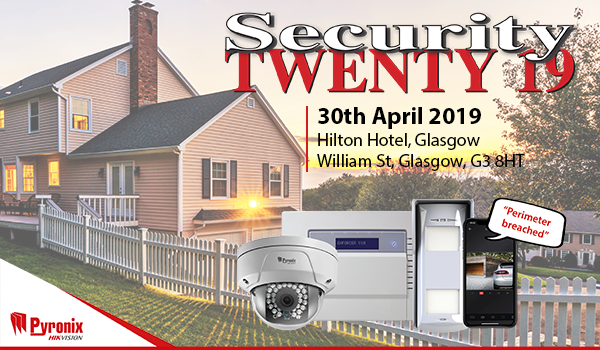 Visit Bryan and Guy on Tuesday 30th April between 08:30 and 16:00 at the Hilton Hotel (William Street) in Glasgow, to see our latest products and discuss our security offerings in more detail. If you register in advance and are an installer, an end user, consultant, or someone involved within the private security sector, you will be able to attend the Conference for FREE.